FA: p1: Dan Dingle, Steve Lesse, July 1979; p2: Vern Clevenger, Claude Fiddler, July 1981. 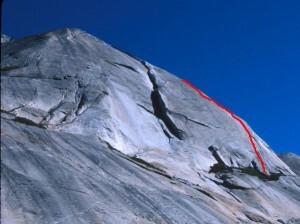 Table of Contents is probably the best thin edging 5.10 slab route in Tuolumne. With good but spaced edges, a natural weakness to follow (at least on the first pitch), and relatively good bolting, it’s also quite popular (for a slab.). The first pitch is 5.10b and popular by itself. The second pitch is more tightly bolted, but harder. Which SuperTopo guidebooks include a topo for Table of Contents?